Archaeological Surveys | Historical Perspectives, Inc.
Archaeological field investigations entail hand or machine excavation of test pits or trenches in search of potential deposits or for the verification of prior disturbance. 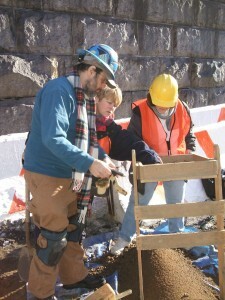 Soil boring analysis and monitoring may provide alternatives to excavation. The firm is able to staff monitoring of soil borings, foundation tests and below-ground construction in both urban and rural environments. Our professionals receive annual OSHA HAZWOPER training and certification for work on hazardous sites. In tandem with archaeological field work, HPI has extensive experience preparing Archaeological Testing Protocols, Health and Safety Plans, and Unanticipated Discovery Plans. HPI has completed all stages of archaeological fieldwork at scores of sites, from the initial field survey to the final full-scale data recovery when required, and is experienced in providing EIS review consultation. HPI is certified as both WBE and DBE by multiple agencies and within several states.